(first posted 7/13/2015) CC reader, neighbor, and occasional contributor Gordon Sayre sent me an email this morning with these pictures attached titled “Paul you will be excited about this car! Yes I am, as well as a bit disappointed that I missed it, parked at Home Depot. For those of you who haven’t been around very long, I am a certified Peugeotphile, and once owned a little fleet of 404 sedans, most of them saved from junkyards. When I finally found a 404 sedan in Eugene, I spilled my love for it all over these pages. But what I had really lusted after was a Cabrio, and I once almost talked a guy out of a sunburned one he had been storing for years in a lot with dozens of sedans in Asuza, CA. Almost…so it’s (still) one of my unrequited loves. As you can see, I wasn’t the only one who loved these cars. Red seems to have been the color of choice for the promotional shots. The 404 Cabrio (and coupe) were neither just open or coupe versions of the 404 sedan, nor genuine sports cars either. They were sports tourers, with the kind of legendary ride most sports cars could only dream about. These were for owners who were not trying to impress anyone with extraordinary performance, although the fuel injected version of the 1600 cc hemi-head four was quite brisk for its time. 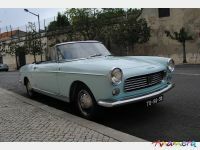 They were a French alternative to something between a Mercedes W111 four-passenger cabriolet and the Pagoda SL, and much more affordable than either of them. 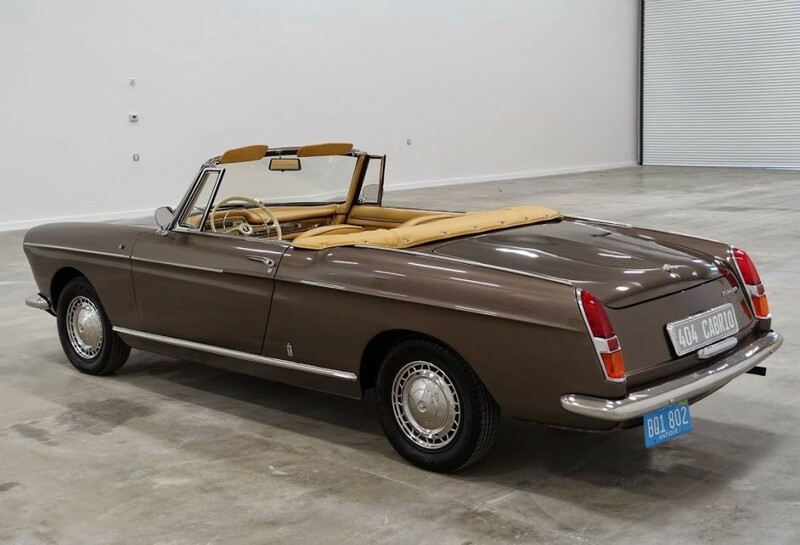 Several times more affordable, actually, a ’66 MB 250 SE Cabrio listed for a whopping $9748; the 230 SL for $6185. The 404 Cabrio was a mere $3899. 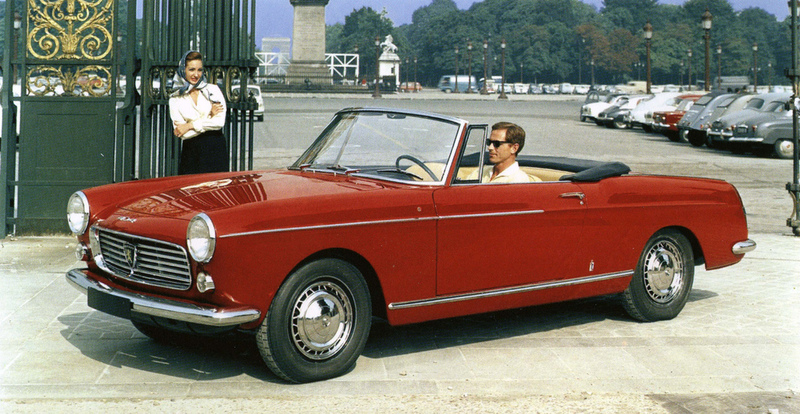 Needless to say, the 404 Cabrio, like all Peugeots for decades, was designed by Pininfarina. 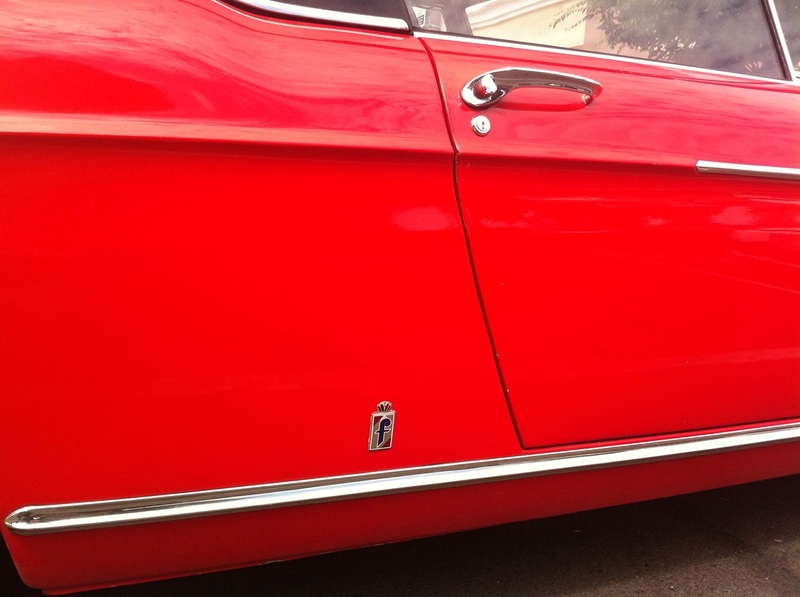 In typical Farina fashion, many of the same design elements show up in other cars, like the Fiat 1500 Cabrio, and were first tried out on various Ferraris. 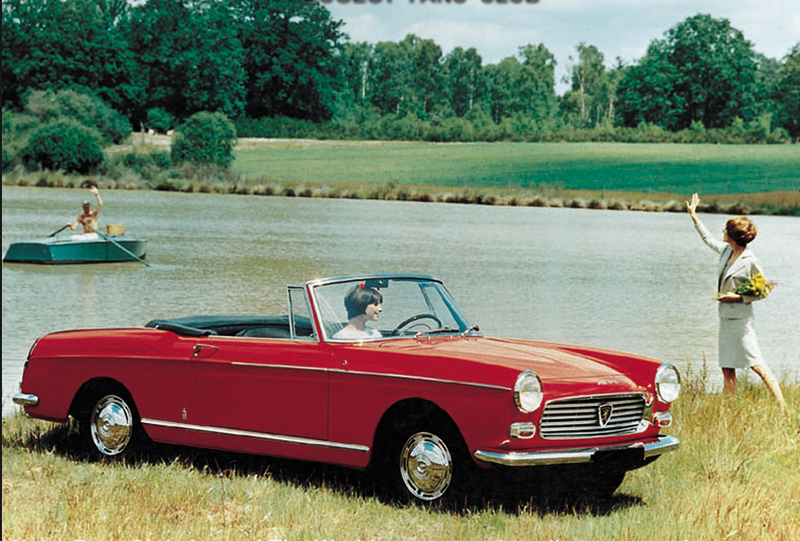 The 404 Cabrio was sold in the US for some years, roughly 1965-1969, but not the fixed head coupe. 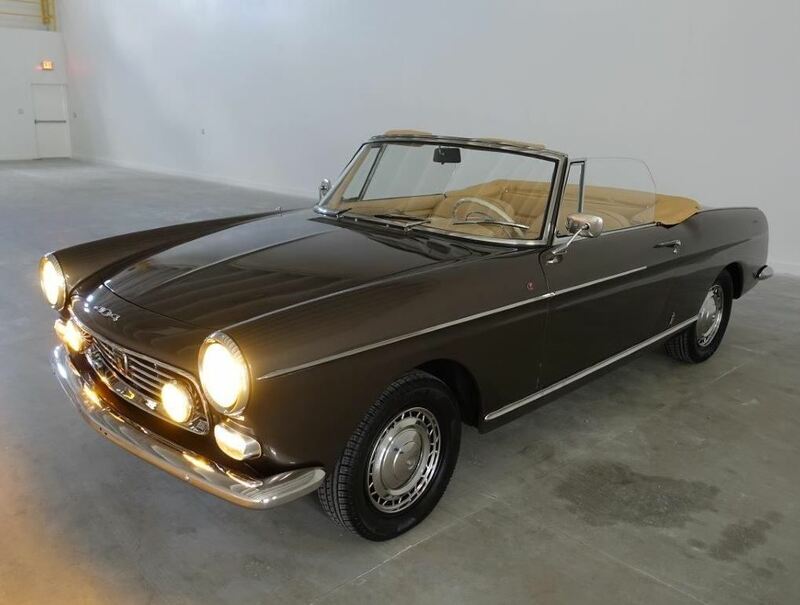 And its successor, the exceptionally beautiful 504 Cabrio/Coupe, sadly were never sold in the US. Gordon didn’t take any shots of the interior, but here’s one from the web. The somewhat unusually flat angle of the steering wheel is obvious, as well as the column-mounted shifter for the four speed transmission. These shifters were much lighter and more precise than the typical American three-on-the-tree, and were a pleasure to use. After a brief acclimatization, I never really wanted for a floor shift. This color combination is very tasty. The featured car is wearing a removable hardtop. Needless to say, these are rarities in the US. I can’t say for certain, but I’m guessing it’s an original US import, which would make it a 1967 or earlier, as it doesn’t have the federally-mandated side marker lights from 1968 on. I’m sorry to have missed it, more ways than one, but I’m happy to know there’s one about in Oregon. If it’s a local car, I’m hoping to run into it again. And if I do, I will also be highly obnoxious and try to buy it from the owner. 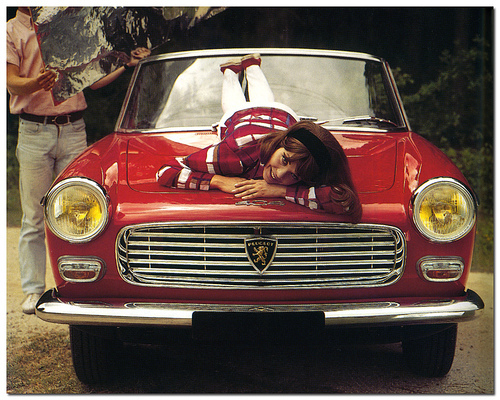 Peugeots had some of the most increadibly comfortable seats ever installed in any automobile. How easily did they fit, as for example the bolt patterns? It would be nice if compatibility information was on hand to avoid wasting time on rabbit trails. Too many carmakers design seats to look good in showrooms or are, at best, comfortable only over short trips for an Average Person (who doesn’t exist). It’s ironic that French cars flopped in a market where native carmakers emphasized ride comfort to a fault. Indeed – that’s one of my biggest problems at the moment looking for a car, what with my ruined back after years of hard work on ships, cars and then sitting for hours at an office (the worst combination). These days, everybody seems to think that “ergonomic” means a sports seat, even for small economy cars. Shallow, hard as a rock and wrongly shaped from my point of view. So far the only cars I found with half acceptable seats were the 2012 Euro Civic S, the Citroen Cactus and the Alfa Romeo Mito… Looking at Renault and Peugeot next. Good luck on your quest. My 2010 Civic LX’s seats are tolerable for commuting. Ford had Recaros on one of the tricked-up Fox Mustangs, but that was a package deal. Are Recaros feasible aftermarket fits? Orthopædic seats are rare even in home furnishings. Ekhornes Stressless is one example; $2K was well worth it for my wife. Why does one have to look to Europe for seating fit for human beings?? Asian cars have seats designed by Asians….whose buttocks are typically miniature in comparison those found elsewhere. Softly padded seats in the old French tradition (Citroen and Renault) have sadly gone out of style. Sometimes lacking in lumbar support, but the right idea. I had a Renault 16 with the squishy seats. For some reason it had zippers down the sides of the front seats, so I opened them up and put a couple of bungee cords across the frame, adding lumbar support. Worked great. I had a ’62 Continental ten years ago. The front seats had gone pretty flat. I had them redone and drove it across the US and was perfectly comfy. Solid bench but curved backrests, lots of foam. No specific lumbar contouring, but enough foam and springs back there that it was perfectly supportive. I guess in the German tradition most cars today have seats that are too hard. I was stuck in a Cruze front seat for about two hours and got a bit butthurt. When buying a new car, trying out the seats and thinking about sitting in one for many hours is crucial. That’s what you do when you drive a car. Sit in the seats. Maybe for eight or more hours a day. Whaddaya mean had, they still do PSA cars are the most comfortable cars Ive ever ridden in or driven, one of the reasons I keep buying them. The grill looks a little different from the sedan, maybe a little less slant. The front end sheet metal, as with the whole car, is unique to the Cabrio and Coupe, despite certain elements looking similar. This is not like the 403 Cabrio, which was based on the sedan body. Happy hunting to you and those are lovely plates for a lovely car. The interior was as pictured on the white model. I did not take photos because reflections made it impossible. The backseat bench offers ample knee room but the near vertical seat back looks uncomfortable. My friend who used to work on these said that the sticker price was close to that of a Jaguar E- type. Is that right? In 1966, an XK-E was priced at $5384; the 404 Cabrio at $3899. The XK-E was in a whole different league, performance wise. The back seats are not really proper adult-sized. Kids, or in a pinch for adults. The passiveness compartment was pushed back from the sedan to give it a longer-lower look. The trick to shooting interiors with closed windows is to put the camera right up to the passenger side window. That eliminates glare. It’s impossible from the driver’s side. I’m sure there’s a joke there… just can’t think of it right now. Beautiful cars, I’ve always thought they looked like a mix between a Mercedes 280 SE convertible, and the Pininfarina Ferrari cabriolets of the same vintage. Very classy, and very well proportioned. A very nice find! I assumed it was smaller than it appears to be, but then looking at the pictures with people inside I got a whole new perspective. Unless those are the diminutive French cousins of the diminutive people that the Big 3 used in their advertising…Beautiful car nonetheless! 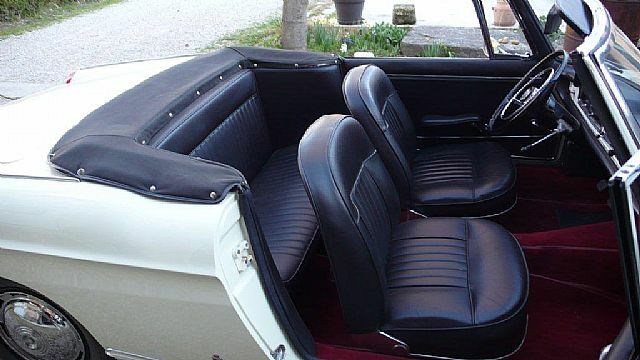 These really showed the light toward the four seat convertibles that all the near luxury makers realized should be part of their line much later. The resemblance to the related compact with the subtly more sporting sheet-metal showed how it was to be done. I am glad the motor was adequate to the task, by the time an American was spending $3800 on their 1966 convertible they were getting a V8 if they chose domestic. The rear of the car to me looks the best. On the modern equivilents, the electric folding top that disappears under a hard tonneau cover leaves the car so much chunkier at the rear. That was indeed quite a find, and apparently in beautiful condition. I don’t know that I’ve ever seen one. Very nice! Certainly not something ever seen as far inland as I live. My level of interest in Peugeots is higher by an order of magnitude than it was a few years ago. 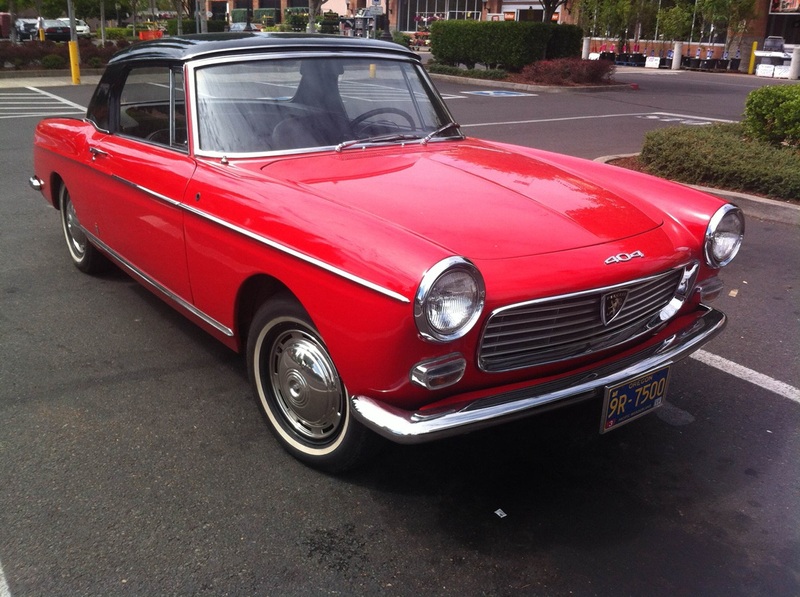 Somebody has to clarify this for me – was Lt. Columbo’s Peugeot one of these (404), or a 403, the predecessor? Wow, what a find. I’ve never seen photos of one with a hardtop before. 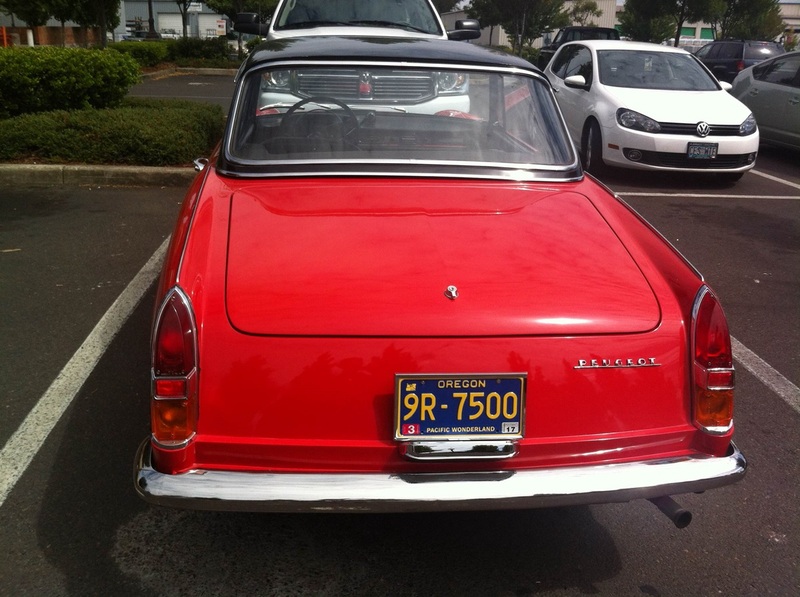 The featured car would appear to be a 1966; it has the dual color front indicators introduced that year, but does not have the updated grill or rectangular indicators that came for 1967. Magnifique! Gorgeous car, Ive still yet to see one live. Almost pretty enough t make me want one but I’ve had Pugs and Citroens plus I worked in a Peugeot Garage so no thanx . This thing really looks sweet . Quite striking and makes a nice counterpoint to the ’66 Catalina featured a little later today! I can say I’ve never seen one of these Cabrios in the metal. 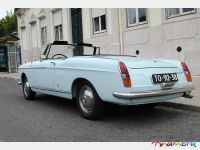 That’s as close as can be to my first car, a Fiat 1500 Cabriolet. Surely from the inspired pen of Pininfarina, yes? Yours would have had the Osca engine, yes? Yes, and I said so as much in the article. These two were about as similar as possible; from the same Pininfarina boutique rack, juts different sizes. Timeless design really. By no means to be pejorative, there is a whole heck of a lot of 1956 Chrysler in this car – scaled back and simplified. Exner was highly inspired by the post-war Italianate school of design. His association with Ghia led to a number of specials. This type of front end design was almost universal in Italy in the post war years, starting with the Pininfarina 1946 Cisitalia. As the years went by, the grille become lower and wider, and the headlights more prominent. It’s Italianate styling at its most classic, and Exner successfully adapted it to the Chrysler. I was curious about that. I looked at your link in the comments and the more prominant cars came after ’56. I think I’ve heard your comments on Exner before. The ’56 Chrysler is really quite elegant, and another classic Chrysler hit after a string of misses. The ’57s were flamboyant, but wore that with decorum. It makes you wonder what happened with Exner in the early ’60s. the Pigeon (Peugeot) or the Egg-xner … ? ???? Great find! A good combination of elegant styling and everyday mechanicals that make the ownership experience easier. I spoke to the owner of one at a car show a few years back. He told me that he drove his around France for a bit before shipping it out, and while in Paris he was rebuked by a pedestrian who said he shouldn’t subject a car with irreplaceable body panels to the dangers of Parisian driving habits! He was quite amused by that. Got to drive a 404 coupe with injection in Paris in the early 1990s. Sadly, my friends who had it needed a larger car with their second child. The odd thing about the car (for France) was it having been an automatique … which kind of dulled the response one would have expected from the upgraded fuel system. Ah well. It was a nice car to pick up a girl I was seeing when she landed at Orly…. It was a nice car to pick up a girl I was seeing when she landed at Orly…. 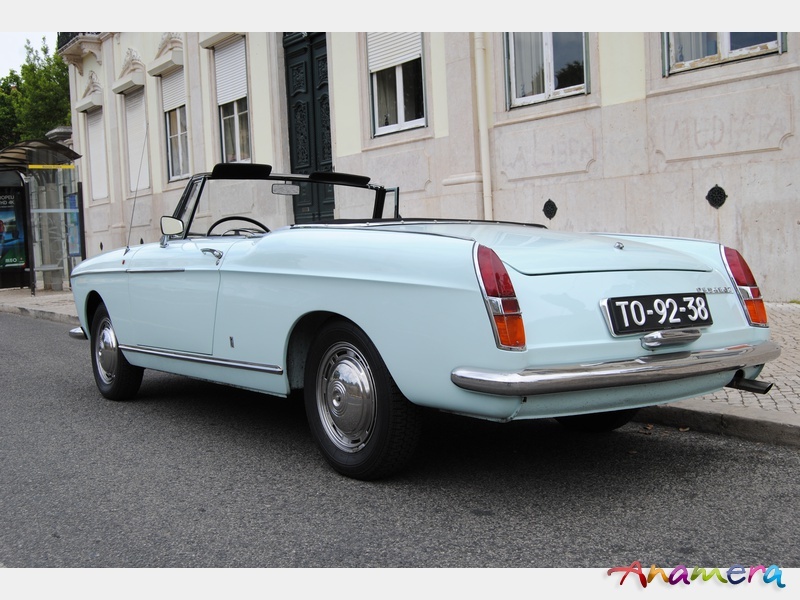 I think a 404 Cabrio would be a nice car for picking up girls anyplace. It would make its driver feel like Alain Delon, or Yves Montand. This is a car that used to be in San Francisco until early in 2015, I know the owner. Moved to Oregon recently. Lovely car. OK, now the lust is becoming contagious. What an absolutely beautiful car from any angle. Am I the only one who sees a miniaturized Rolls Royce Corniche without the big honkin’ “Look at Me” face? It’s understated elegance, pure and simple. I see a lot of Corniche too. That, Fiat 1500 spider, and Alfa 2600 spider. Yet at the same time it doesn’t look derviative at all. What a model of classical elegance. I am drooling. How embarrassing. Am I the only one to have driven one? My friends Marie and Bruno had one in Paris in the early ’90s. I borrowed it to pick up a girlfriend as she landed at Orly. Bad traffic out to the airport made me late and then we kept missing each other in the airport for over an hour and a half that morning. Kind of how the relationship devolved from there…. ….and soon she’ll be back in California, in the Napa Valley.